Quick! Name something you find in a toolbox. If you said hammer then you have hit the nail on the head with this fast playing word for word party game. Draw a topic card and then race to shout out answers until someone says the exact word written. Get the most right and Thats It! you win! 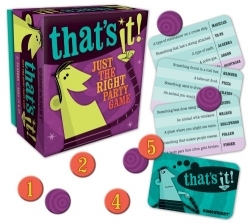 For 3 or more players, Great at parties! Playing time 15 minutes.